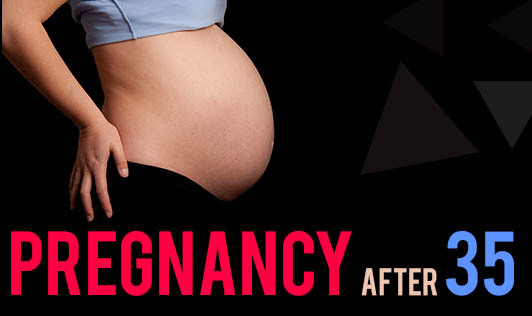 Pregnancy after the age of 35 is becoming common these days, the most common reasons for this being late marriage and career. After this age, a woman will not only need good health to conceive, but may also need a bit of luck, and sometimes, wealth! 1.Women over 35 are more aware of their bodies and are conscious about their health when compared to younger women. 2.They are psychologically ready for the symptoms and the stress of pregnancy. 3.They are financially well-prepared for the baby's needs and are independent. 4.They have more experience in people skills and can handle the varying moods of a baby. 1.Fertility rate decreases as age increases. This will delay the time taken to conceive. 2.Older women, though psychologically prepared, may not be able to handle the physical stress of pregnancy as compared to younger mothers-to-be. 3.There is an increased risk of Gestational diabetes (pregnancy-induced diabetes), hypertension (high blood pressure), still-birth, miscarriage, premature delivery and cesarean section. 4.There is a high risk of the baby being born with genetic disorders. 5.The mother, if not physically fit due to age, may find it difficult to run behind her little one once he/she becomes physically active. While career is an important part of life, having a baby at the right age is also important. So, plan to have a baby when the time is right, before it takes a toll on your body! !